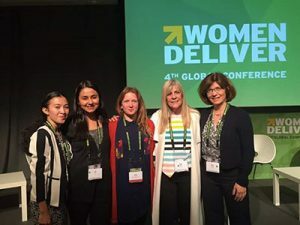 When HAI Timor-Leste midwife, Rara Dethan, attended the Women Deliver Conference in Copenhagen, Denmark in May 2016, she was supported by a Women Deliver Young Leader Scholarship. The focus of the conference was the rights and well-being of girls and women. While at the conference, Rara was inspired by many discussions she had and by the people she met. When she returned to Timor, she was moved to take action on behalf of women in her own country. Through her work with HAI, Rara regularly sees the struggle of many Timorese women to find work that can help support their households. 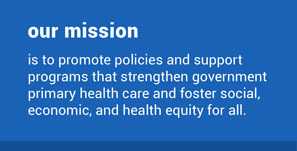 The opportunities for work, particularly for women with little or no formal education, are few. Rara decided she wanted to help this group of marginalized Timorese women to create their own businesses to generate income for their households. Rara made connections with three older women, all neighbors in the city of Dili, the capital of Timor-Leste. One of the women is a widow with limited household income, another is a recently retired woman, still in need of income to support her family, and the third is a mother of 13 children, with obvious needs for such a large family. The three women call themselves, Ama Ferik, which means ‘old woman’ in the local Tetum language. 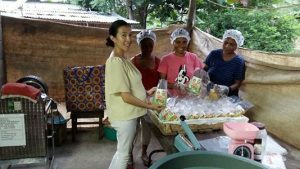 Utilizing a microfinance model, Rara provided the initial investment for the women to start a small home industry to make locally produced healthy snacks. With Rara’s assistance, the three Ama Ferik established a kitchen work area in one of their homes and they work six days a week producing banana and cassava chips. The brand name of the healthy snacks is appropriately, Ama Ferik. “We are happy with this home industry, because it can help us to add to our household income. I am now able to buy my children’s school materials and other household needs” (Ama Ferik business owner). Rara says that in addition to providing a source of income for the three women, the Ama Ferick business purchases locally grown banana and cassava from farmers in the rural areas. The banana chips are made from a certain variety of banana that is not easily sold in traditional markets because it is not the preferred variety for traditional cooking. Farmers complained that it often had to be discarded or used to feed livestock. However, the women have found it is the perfect type of banana for making their chips and also provides farmers with an outlet to sell their crop. Rara continues to support the women to market their snacks in local supermarkets and restaurants. 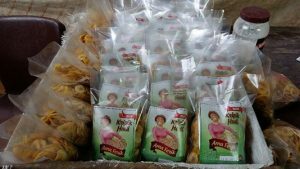 They currently have several locations around Dili where the Ama Ferick snacks are available. With the income generated from sales the women re-invest in supplies for continued production and also generates a modest income for the women. Rara enjoys staying engaged with the Ama Ferick women to provide encouragement and support.